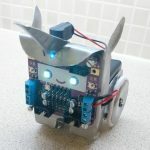 I’m off to Maker Central at the NEC next weekend and thought it would be good to have a badge so that people I knew only from online might recognise me and to act as a talking point for new friends. 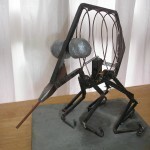 I though it would be great to show a mix of mediums such as wood, metal and 3D printing. I’ve recently been experimenting with Electro-luminescent wires so thought it would be good to incorporate those as a technological aspect. 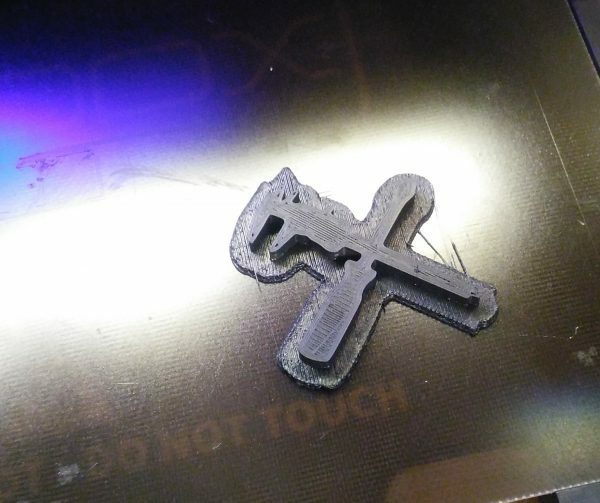 I also wanted to include my website logo, it made sense to 3D print that but first I needed to get it as a 3D model. The logo I had in Gimp format so I exported that as PNG, used an online converter to recreate it as SVG then imported it into TinkerCad. I should also have been able to do the same with InkScape but I did not have it to hand at the time. The logo was exported as STL so that I could print it. 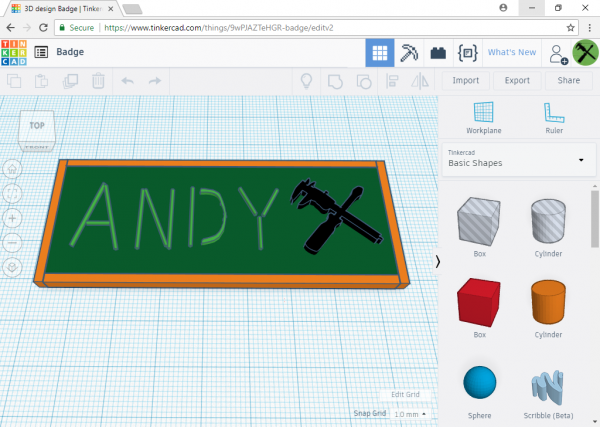 I mocked up the rest of the badge in TinkerCad so I could see how the components fitted together. I used the new “sketch” feature for the curve of the D but I’ve since been watching some tutorials which show better techniques for that kind of shape. The simplest part of the badge was the back board. 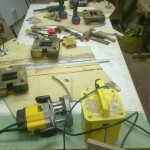 This is just a piece of 3mm plywood, made from the scrap from the dolls house kit. It’s been painted green and drilled for the EL-wires. The EL-wire is 2.3mm lime green wire. I did a mock up of how these might work using a piece of card. The wire is held in place with a combination of hot glue on the back, split pins and the holes themselves. I’ve a tiny power supply for them which should slip in the a pocket and an extension wire if necessary. I loaded up the 3D model into my printer software and scaled it to 35mm x 35mm x 3mm. As I’d had issues with fine details curling up off the bed before, I printed it using a raft. This is simpler shape with several sparse layers to form a platform to print on. The ABS to ABS adhesion is good so the fine details don’t suffer. It’s a bit of a pain to remove it from the raft but a sharp knife or small chisel will do the job. 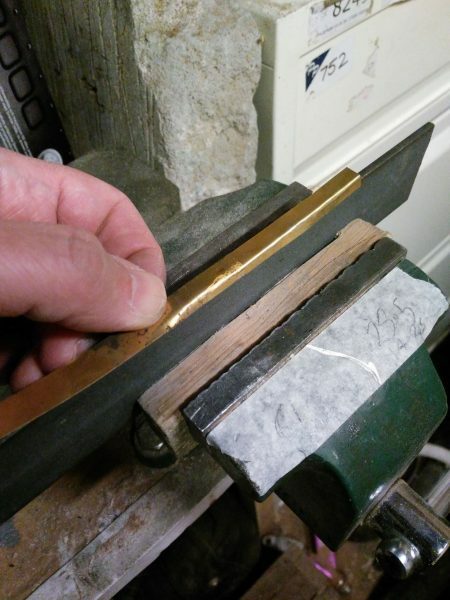 My last material was brass for the frame. I did not have any preformed U channel so I cut some thin strips then used a piece of 3mm steel as an anvil to form the shape with a hammer. This proved a little problematic as the material was springy, that was resolved by hammering it away from the former and allowing it to spring back. 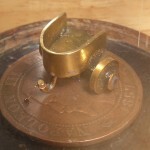 The brass had to be made in several pieces due to availability of material. It was glued around the outside of the badge using superglue. There’s one more step to be done before next weekend which is to add a suitable clip or pin to the back. I’m thinking about a short leather strap for that.